We found this pearl in 1992 in North Kingstown, RI. It is 17mm in diameter. 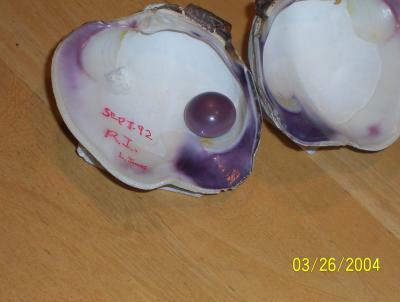 The picture shows the pearl in the original shell. We still have the pearl. Waiting to ascertain value. Just curious - what have you done with your pearl? Are you planning on keeping it as is? Will you mount it to a piece of jewlery? Or, are you planning/have you sold it? Thanks for the great photo of your big Quahog pearl. It's gorgeous! And also the largest one posted on this site so far. I love the fact that you still have the original shells after all these years....good for you for keeping track of them. I would have expected a much larger shell for that size of pearl. Looks very similer to another pearl on Kari's QUAHOG PAGE.it also has that egg yoke look to its top surface,very nice indeed.that one is only 10.5 mm again they all are very very nice.Good luck with it!